Slow-cooked beef and pork bolognese with red wine and oregano, on a bed of spaghetti, topped with fresh parsley and a sprinkle of parmesan. This recipe is made with some raw ingredients and isn’t suitable for microwaving. Remove the film but leave the spaghetti bolognese in its wooden tray*. Place on a baking tray in the centre of the oven and cook for 30 minutes. If using a gas oven, cook for an extra 10 minutes. The spaghetti is in two nests to make it easier to serve, and for the finishing touch, sprinkle the parmesan on top and enjoy. Spaghetti (water, durum wheat semolina, sunflower oil, salt), tomatoes, red wine, British beef (8%), smoked bacon (5%) (pork, water, salt, preservatives: sodium nitrite, sodium nitrate and potassium nitrate, antioxidant: sodium ascorbate*), British pork (5%), onions, tomato purée, milk, carrots, passata, Parmigiano Reggiano Cheese (milk), celery, rapeseed oil, wheat flour, balsamic vinegar, chicken liver, extra virgin olive oil, beef stock (British beef, yeast extract, salt, tomato purée, molasses, lemon juice concentrate, onion powder), garlic purée, roasted tomato sauce (semi-dried tomatoes, sunflower oil, tomato paste, extra virgin olive oil, sugar, salt, dried oregano, dried garlic), fresh parsley, sugar, oregano, red pepper flakes, salt, black pepper, Worcestershire sauce (water, sugar, spirit vinegar, molasses, onion purée, salt, tamarind paste, cloves, ginger purée, garlic purée), ground star anise, nutmeg. 1. Peel and cut each onion into approximately 2cm wedges, and arrange these in a single layer on a lightly oiled baking sheet. Brush the slices with olive oil, season with salt and pepper and place on a high shelf in the oven for 25-30 minutes, until they are beginning to look toasted at the edges and feel tender when pierced with a fork. 2. While the onions are cooking, crush the garlic into a mixing bowl, add the salt and then whisk in the lime juice, olive oil and a good twist of black pepper. 3. Remove the onions from the oven and transfer them to a bowl. Pour the dressing over the onions while they are still warm, tossing them around to coat with dressing. Leave them until they’re quite cool. 4. To assemble the salad, arrange the ingredients in layers; first a layer of rocket leaves, then onions and then flakes of parmesan. Sprinkle with the dressing as you go. Continue like this, finishing off with a layer of parmesan, and serve with Charlie Bigham’s Spaghetti Bolognese and a loaf of warm ciabatta straight from the oven. 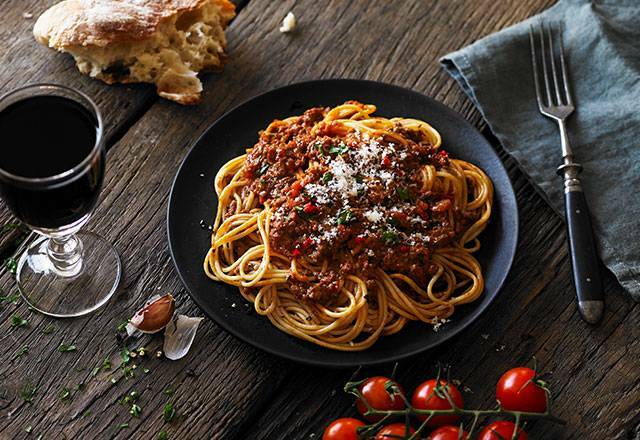 Spag bol and a glass of red wine is a classic combo. We’d go for a medium-bodied Italian red, like chianti, or a cabernet sauvignon.